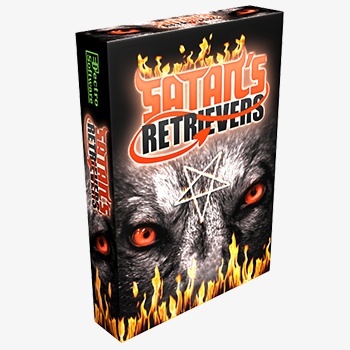 It's been a long time coming, but Electro Software, of GameDogs fame, has finally released its highly anticipated first title, Satan's Retrievers. Hell has finally frozen over and it's up to one dog to set things right. And as we've learned from countless videogames, the best way to solve any problem in any videogame is to pick up a gun and start shooting everything you see. You play as Caine - part dog, part goat and all badass - as he battles wave after wave of animals, trying to kill enough to earn his way to Hell and become Satan's Retriever. It's as polished and sophisticated as any game you might get from those other fat cat publishers, but it has the added bonus of being free, and having a difficultly level so high that replayability is virtually infinite. Are you dog enough to take on the challenge? Are you goat enough to win the badge? Are you badass enough to actually finish the thing? There's only one way to find out. Go play Satan's Retrievers right now. If your boss complains, quit your job.